Before we left home in December, we hauled out our maps and plotted a general course that we wanted to follow once we hit Arizona. We made a few reservations at campgrounds where we thought they would be critical, and left big gaps where we could fill in as the spirit moved us. Thus, we found ourselves with only four days to fill in two spots we had targeted to see – a violation of our new (this year) 3 Night Minimum Stay rule. But you know what they say about rules….. So, we found ourselves heading to Fool Hollow State Park in Show Low, AZ. Map here. It was about the right distance from our prior stop at Roper Lake – we really don’t enjoy long days in the truck. Laundry duties and grocery shopping always seem to take a big, unwanted bite of our time. So, our anticipated 170 mile drive was plenty. It’s John’s day to drive, so I set up navigation on my phone, and off we go. Consulting my atlas (I LOVE paper maps), I see we’re going to pass through a place called Salt River Canyon, but I really don’t give it much though. 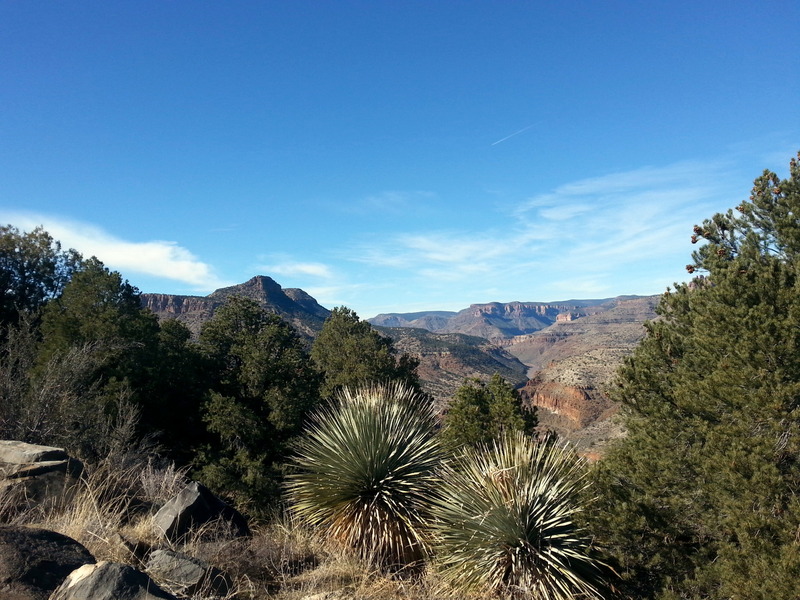 As we roll along, suddenly, the high rocky sides of the road give way, and we find ourselves in the most gorgeous canyon. My photos really do not do it justice. It was spectacular! What a surprise! 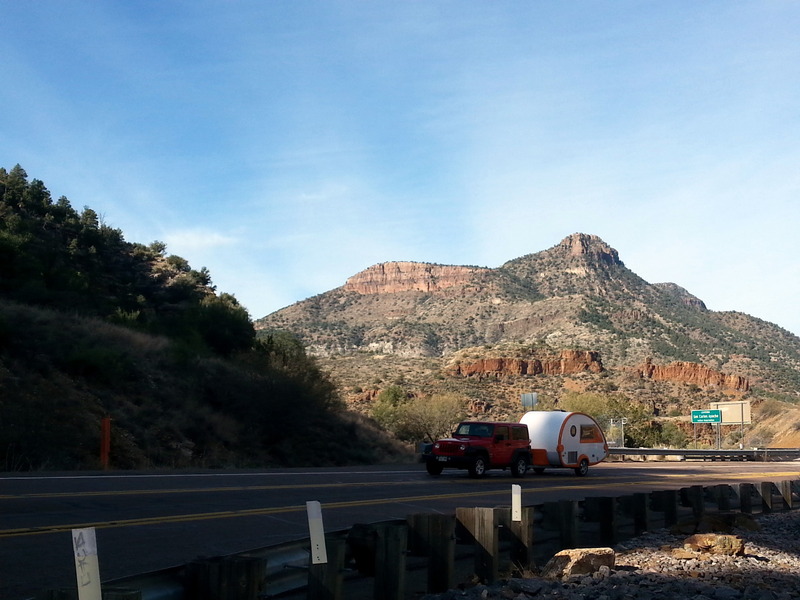 Rolling into Fool Hollow, the Ranger allowed us to drive up into the campground to select our own spot. This is my favorite time of any day – the suspense of arriving at a new, unknown campground is a great happiness to me. We were not disappointed. Fool Hollow SP is pristine. Gorgeous. Only one of their five or six camping loops is open, but there are only four other occupants. One’s a T@B! We are foolishly delighted to find kindred spirits, and take a spot near them. The sites here are so huge that it wasn’t like needlessly parking right on top of someone. We walked every inch of this park in the days we were there – it must be heaven in the summer – at 6300′, it must surely be a cool haven. Every site was raked and cleaned – I felt guilty for the footprints I left (everywhere) looking for firewood to feed our hungry firepit. It was cold at night (high 20s), and there were bits of residual snow from the past weeks. 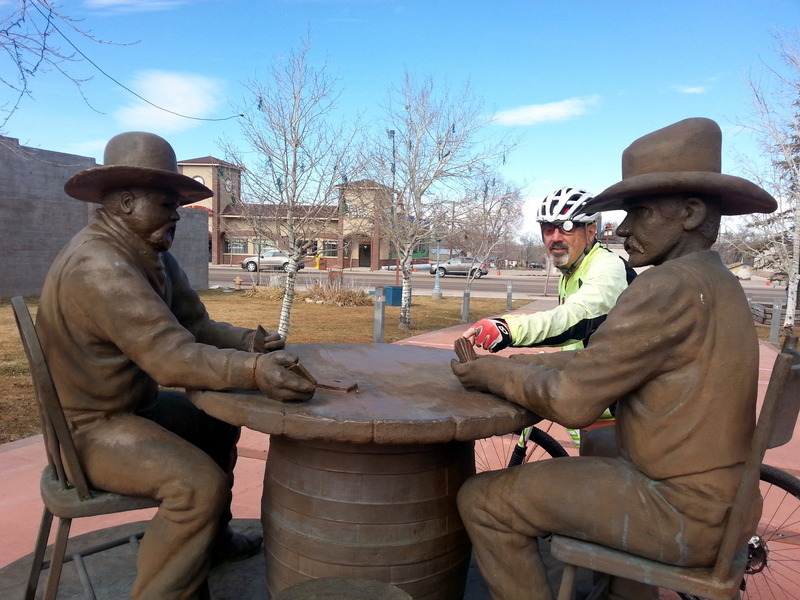 But, it warmed into the high 50s during the day, making it perfect for bike exploration of Show Low, the nearby town. Why is it that the minute we get on our bikes, we are starving? 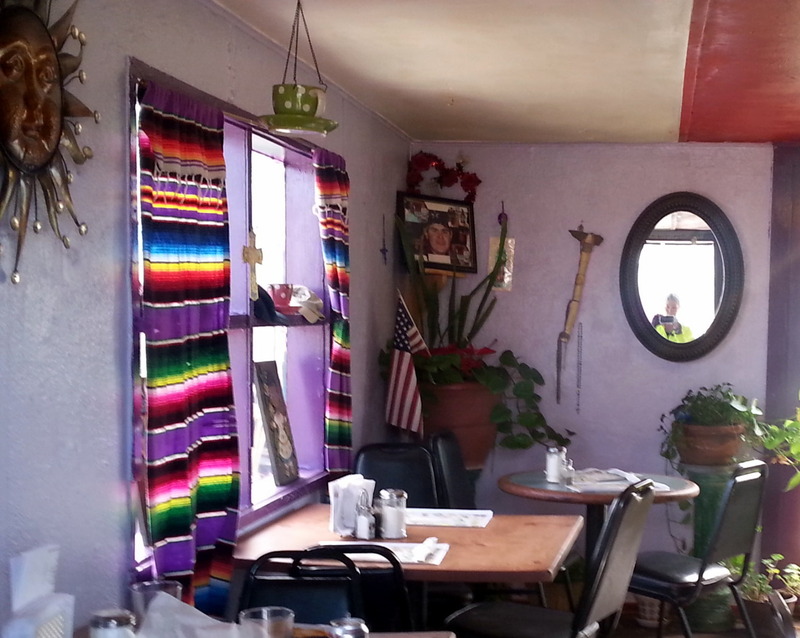 We dive for a spot to eat, finding a tiny little tortilla shop called El Milagrito. Perhaps this is not the ideal spot for everyone, but we LOVED it. We ordered a taco and a Sonoran hotdog. omg….the warm chips and salsa we were served prompted us to order a bag of chips to go. This was a piece of heaven. 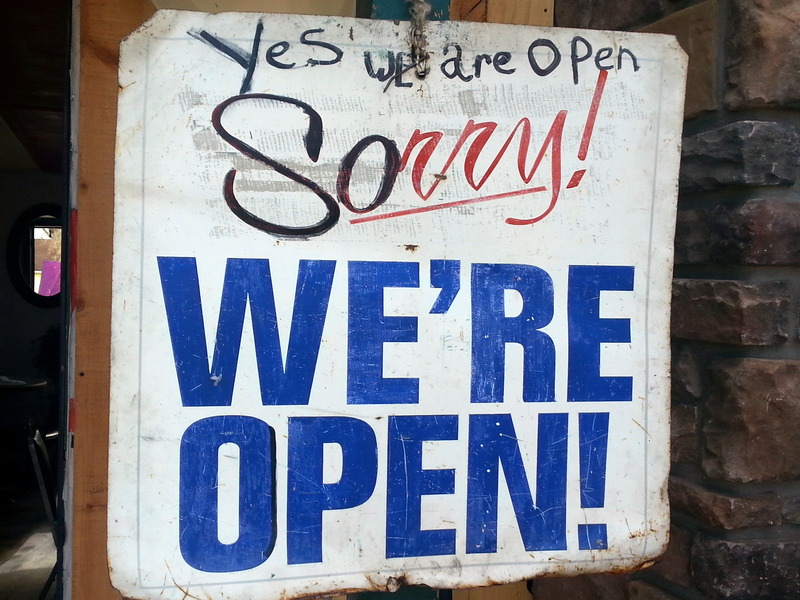 Plus, they have the best sign – EVER! Show Low is named because control of the town was won in a card game between the two principal landowners in 1876. Deciding that the town was not big enough to support two families, the two played poker for control. When they decided to draw for low card to win, the first gent thought he had it made when he drew a 3. Alas, the second card was a deuce. Hence the town was named Show Low, and the principal street is called Deuce of Clubs, the card drawn. We wandered around a bit, then headed back – not much happening in Show Low. Back at camp, we basked in the beauty of our surroundings, and endeavored to meet our T@B neighbors. After the second morning, we two were the only campers in the entire State Park. How cool is that? 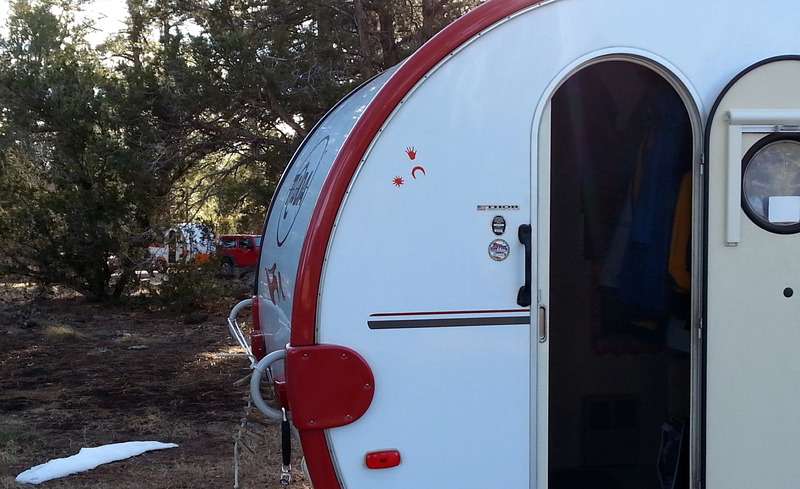 We share Happy Hour and camping stories with Loren and Deb Trout of Boulder(ish) CO. I hope that we’ll stay in touch, or better yet, stumble across them in another campground somewhere. 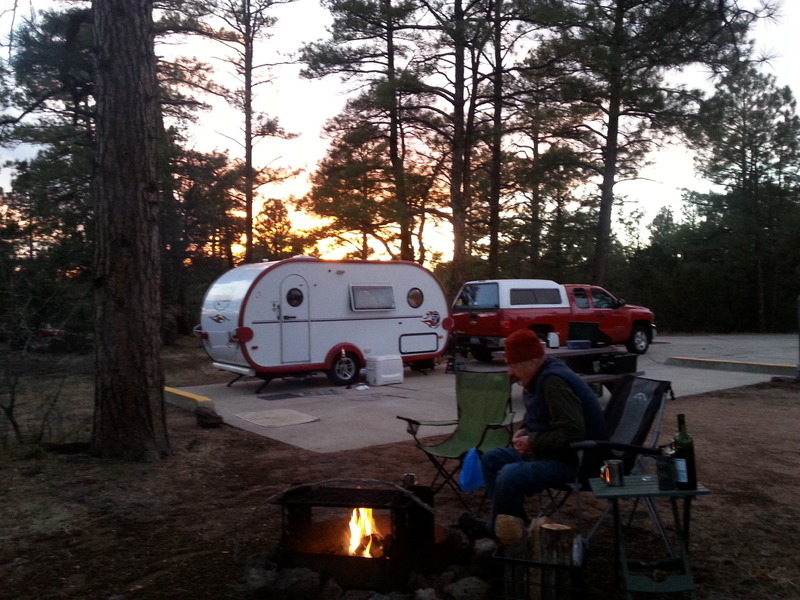 This entry was posted in Arizona, camping, cycling, retirement, RV life, simple camping, state parks, T@B, T@DA and tagged Arizona, camping, cycling, El Milagrito, food, Fool Hollow SP, retirement, RV life, Show Low, simple camping, state parks, T@DA by Judy Crankshaw. Bookmark the permalink. Wish I had a big bowl of those chips right now!!! Beautiful canyon! !!! I am wondering, do you know why the building were dome shaped, as in your next to the last picture? I agree — the scenery is beautiful! 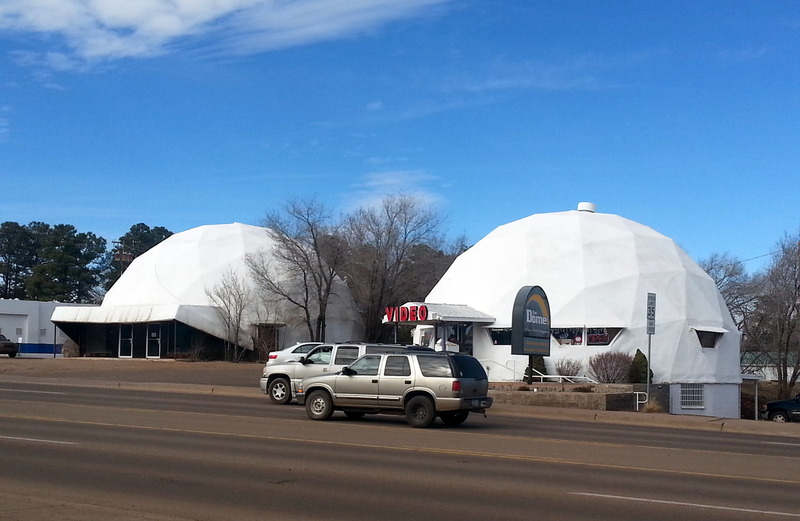 Not sure, but my guess is that they were built as novelty buildings, probably during the Buckminster Fuller era. They were blindingly white! Good for desert heat, I’ll bet. Every new campsite is so different than the last one. Makes for a fun trip. More breathtaking exotica. You and John have a gift for finding unique, beautiful, and amusing spots. So glad you share them with us. I look forward to each entry. How I envy you! It sounds like an ideal trip. Someday, someday! Safe travels to you guys. Thanks, Jennifer. What I’m liking about this trip is that we’re in spots that John has never visited before. He’s spent lots of time here in AZ, so we’ve visited a lot of his favorite old spots until now. Hope you get the chance to hit the road soon, too. I just love stumbling upon unique finds and looks like you did exactly that. 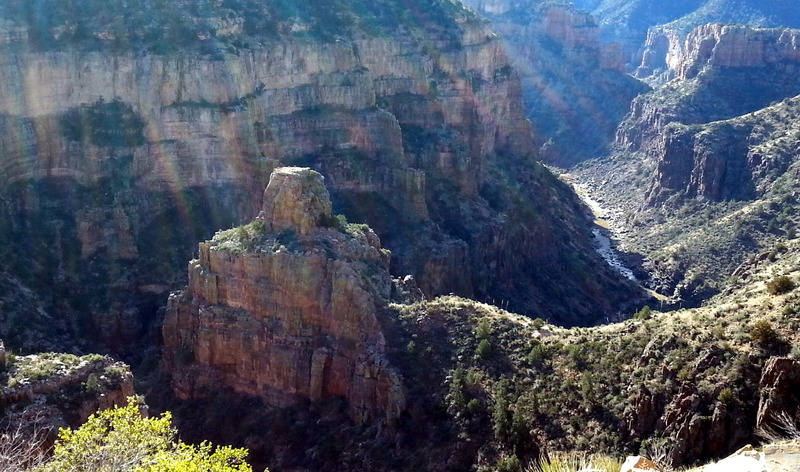 Those beautiful canyons are always difficult to capture on film…. always breathtaking. I’m making a note of that restaurant – our cup of tea! Walking into the restaurant was a bit shocking. Although clean, it was kind of shabby, and oh so cluttered. Can’t believe they could even turn around in the tiny kitchen. We chatted with all customers who came in while we were there – it was a really nice experience. Would have loved to be driving through the canyon early morning or late. It would be spectacular in low light! So, were Loren and Deb the T@B people? I hope so – it’s such fun to meet kindred spirits along the way. 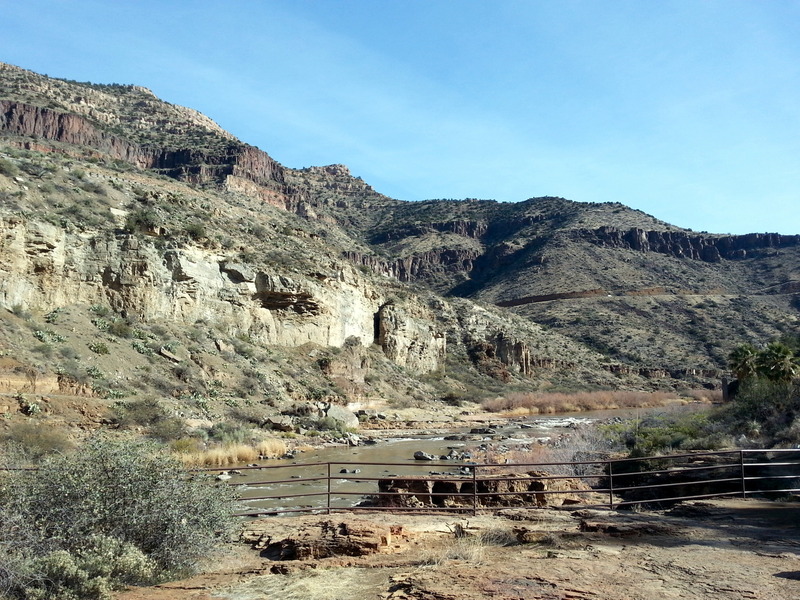 Loved the Salt River canyon photos. Surprises like that just take one’s breath away!! How are the temps out there in AZ? John looks bundled up in that last photo. Yes, they were the T@B folks. We gave them the FB info…..hope they pop up there soon. They have a 2008, which they’ve had for a couple of years. They invited us to camp in their driveway – we are trying to figure out when we can get to Colorado! Although it warms up nicely in the daytime, it’s still pretty brisk in the morning/evening outside. Gets into the 30s most nights. We spend a lot of hours wearing fleece! AZ sure has lots is spectacular scenery. It is SO NOT Michigan! Makes for a great escape. AZ sure looks good now, but I’m glad we’ll be a couple thousand miles away when summer comes. Hope your weather is warming up a bit, too. Thanks, Jerry.